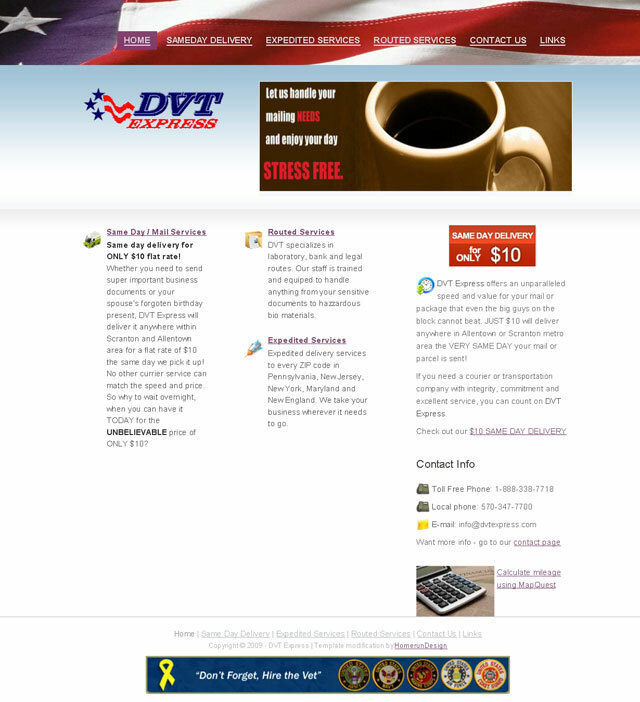 DVT Express is a premier courier service provider for NEPA and tri-state area. An pre-built template was used for the main structure of the design, however it was heavily modified to meet the specific needs of the client. Lot of emphasis was placed on promoting client’s new delivery service. For that, the “call for action” has been used throughout the web site in the form of static as well as animated banners. Most text came from client’s old web site, but it was re-structured to be SEO friendly and new photographs were used to increase overall appeal of the web site as well as to promote client’s services. The web site is mostly a regular XHTML with CSS, however lot of php ‘includes’ were used to automate some repetitive elements and enable easier updates. Of course, Photoshop was used to create new graphics, or to touch-up artwork from the client’s old web site. Thank you for designing a great looking website and for your patience during the revision process.